As funding for public services continues to be under pressure, library services need to look at ways to diversify their funding: generating additional income streams to help support existing services and to develop new ones. And there can be other benefits over and above the money raised: an Arts Council England-funded report from 2016 exploring income generation in public libraries found that adopting an entrepreneurial approach to developing new purchased products, services or facilities could not only help raise much-needed revenue, but might also help libraries attract new customers and improve footfall. That report also concluded there is no one way to generate income for public libraries - effective solutions depend on local context, demographics and competition - and that it’s critical to have a strategic approach, a good grasp of the competitive environment, and the commercial nous to spot opportunities. A lot of possibilities - but where to start? However, it can be difficult to know which approach might be right for you, and how to start. So we ran two free Masterclasses on these issues (in London on 4 May and Nottingham on 12 May) to share information and insights on different approaches. As always, our emphasis was on practical learning and stimulating ideas through debate and sharing knowledge. What did the events cover? We worked with RedQuadrant to organise these Masterclasses. Each event was split up into sessions covering different aspects of income generation and alternative funding models. Some sessions ran in both venues - those on commissioning run by Jessica Harris, a session on taking a more commercial approach to income generation run by Brighton and Hove, and one on new ideas in fundraising run by Sue McKenzie from RedQuadrant. We learnt from the Association for Cultural Enterprises (ACE) at each Masterclass - Caroline Brown, the Head of Commercial Services for the British Library led in the London session, and ACE’s Chief Executive, Jill Fenwick, talked in Nottingham - about libraries in a commercial world. In Nottingham, we also heard from Melanie Mills from Big Society Capital about ‘Doing libraries differently: financing alternative library provision outside of a local authority setting’; and from Charlotte Collyer from Libraries Unlimited about working with volunteers to develop new income streams. In London, we had a fascinating session from Sue Williamson of St Helens Library Service, talking about being commissioned to deliver services. The focus was very much on the practicalities and the challenges of establishing these new approaches, bringing together the real-life experiences of trailblazing library services. Most importantly, attendees had the chance to hear from, and put questions to, the people who are working on these issues - in workshop discussions, question and answer sessions and, often just as importantly, informally and directly during networking breaks. What do we mean by commissioning? Jessica Harris (Cultural Commissioning Programme Manager at NCVO) manages the cultural commissioning programme which is funded by the Arts Council to build stronger relationships between libraries, arts organisations and museums with public sector commissioners. 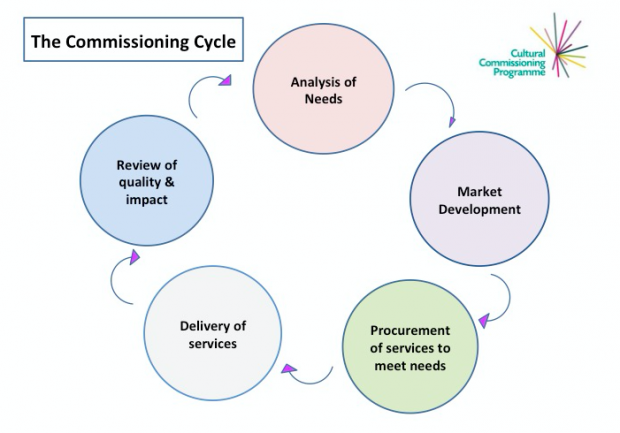 This session took participants through the commissioning cycle (see diagram below), the importance of understanding the outcomes that commissioners are working towards, and matching your activities and potential contributions closely with these. It stimulated discussion on what data and evidence was needed to show impact - balancing the effort needed to collect it with its value to make your case. Jessica also talked about how to find out about future tendering opportunities - by building relationships with potential partners such as clinical commissioning groups, joining with local voluntary sector consortia to position yourself with possible partners, and by doing some desk research - for example, looking at your Joint Strategic Needs Analysis and local Public Health annual reports to understand areas where local needs might be growing and presenting you with opportunities. But she also counselled caution in deciding whether to put yourself forward for contracts - in particular, being realistic about what resources and capability you had, and whether taking on a particular commission would over-stretch you. Sue Williamson spoke in London about St Helens’ experience of building commissioned activities and commissioner relationships. She talked through the process of developing this work, which focussed on using the arts to help well-being in a variety of ways. Libraries had been able to play a powerful role because disadvantaged people had found libraries less intimidating than more traditional arts venues. Off the back of this initial work, St Helens now had a programme of cultural hubs, focussed on users of adult social care with a wide range of activities offered, with over 11,000 attendances from 2,500 participants. 44% of their audiences came from groups who don’t generally participate in arts activities; as opposed to a national average of 20%. In response to questions about charging for activities, Sue said that they had tried different models but had come down on the side of making a modest charge for these extra activities; based on the fact that, in her experience, people value more highly things that they have paid for. Sue drew out the impact that it had had on their service. She felt that it had positioned cultural services at the heart of what the library service did, and had increased their profile across the rest of the council and local public services. She had used funding from public health to employ a libraries coordinator who is focussed on developing future opportunities, including outreach. She emphasised the importance of building profile, to create a position where people had started approaching them based on their track record of delivery - she described this as helping them ‘get through doors rather than knocking on them’. But she also suggested that to operate effectively in this way, it was important to develop skills and time in disciplines such as bid-writing, evaluation and collating feedback and evidence of impact. Doing this sort of thing well would ensure that libraries achieved full cost recovery and didn’t undersell themselves. She finished by emphasising that it was important to understand and establish the true costs and value of what you and your staff contribute; that way you will be taken seriously and avoid losing out. Caroline Brown spoke in London about how British Library were working to build their income streams, but at the same time focussing on matching these activities to their overall aims/mission. For example, they were always considering whether what they did complemented their overall brand, and contributed to overall awareness and audience development. This meant deciding carefully on the nature and quality of what was being done or sold. Caroline talked about potential barriers to overcome; for example, adjusting staff thinking and established culture to understand and accept the role that income generation can play in supporting the library’s core functions, the need to invest to reap good returns, and the skills that would be needed to run specialisms like retail and hospitality that might not be found in the existing workforce. She also urged a very business-like attitude to going down this route - testing ideas initially small scale in a low risk way, building analysis and data in early, iterating and accepting some degree of risk but being prepared to change or stop what you are doing if it doesn’t work out (she pointed out that 25% of businesses fail in the first year, and 50% in the first 5 years). Caroline emphasised that if you can identify the right products, building on the library’s strengths, and then present them in an imaginative way (which didn’t necessarily mean expensively), people may be prepared to spend more with you, to support the organisation. She also supported the value of making a modest charge for activities - quoting problems when people were turned away from free tours when they were overbooked, only to find that they ran below capacity because of ‘no-shows’. In Nottingham, Jill Fenwick talked about the work that the Association of Cultural Enterprises do, and the resources on its website that libraries could learn from. They have a small Cultureshop TV channel run on Youtube, they blog regularly to highlight case studies covering a range of possibilities such as retail, monetising space, venue hire, etc. They run study days to explore different approaches in detail and a trade show runs alongside their annual conference. Jill talked about the added value of commercial activities such as cafes as an ambassador for your library - whilst income is an advantage, it can also drive visits. She talked about a community library example from Haydon Bridge in Northumberland, which had built up all sorts of income generating activities, including a sponsored bike race, hiring out resources such as jigsaws, and facilitating plant sales. She ran through all the different things libraries might monetise. These included your collection; your buildings and underused spaces, including out of hours opportunities; staff experience - and underpinning all this, your deep knowledge of your users. Her advice was to think big, start small, plan for growth, to invest, and recruit and build skills needed over a 3 year period. Building up a meaningful income stream is not a quick fix! Charlotte Collyer from Libraries Unlimited talked about the journey they had gone through with developing their Fab Lab to generate enough income for it to be self-funding. They had revamped the business model a year or so after launch to clarify their offer and to maximise return on the investment made, both financially and socially. Volunteers now give time to staff the Fab Lab in return for use of the equipment. Libraries Unlimited’s new business model balanced a clearly defined membership scheme with some open sessions, a regular weekend Digiclub, and a day where access was reserved for specific workshops. There was also a graduated scale of hourly charges for different machines, rather than a flat fee for usage. Charlotte used a Lean business model, [youtube.com/BMC] which is kept constantly visible and under review. She’d been active in developing library staff as ambassadors for the Fab Lab - running short briefing sessions so they could spread the word to library users and local communities. She’d also seized on other opportunities to promote the facility - for example, taking it out to a Radio 1 youth academy session, where 6000 or so people passed their stand. Anne Hallinan and Louise Millard came along to talk about the work they had done in Brighton and Hove to develop 2 commercial strands of work: their bookstore at Jubilee Library, and events, activities and conferences held in the library. 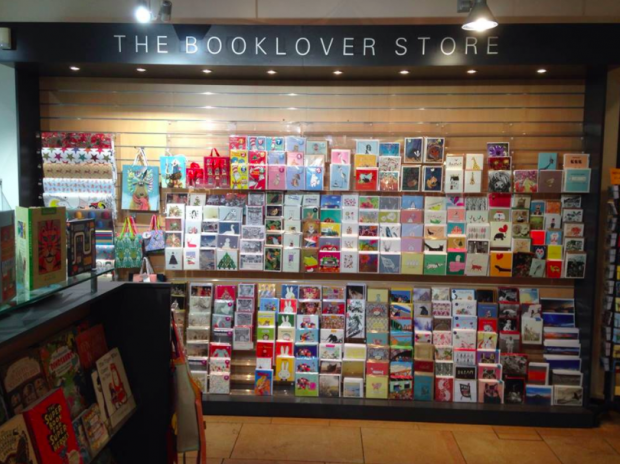 The Booklover Store is managed by the commercial and conferences team (although it doubles as an information point). Positioning near the entrance was regarded as critical to success, and some people come specifically to shop there despite keen competition from the shops nearby. The shop has been stocked with users firmly in mind; for example, as there is a large number of under-5s, the party gift market is consciously catered for; and items with local connections are stocked with tourist footfall in mind. The shop builds on the prevalence of local talent, eg. greetings cards designed by local artists, as well as stocking a wide range of items designed to appeal to booklovers. Ann and Louise talked about the challenges of buying; negotiating the world of local exclusivity deals, covering the right trade fairs, balancing bulk discounts against having excess stock; and also pricing to achieve income targets. They are planning to develop their own range based on the library special collections, which they feel are a very marketable asset. They had used a retail consultant in their early days and felt that this initial advice had been money well spent. They did discuss areas where the retail side profit was curtailed by operating alongside the library; for example, by generally sticking to the same opening hours (although the shop did open on Christmas Eve when the rest of the service was closed to make the most of last minute demand for quirky and interesting gifts!). They also explained that they had tried opening similar outlets in smaller libraries but it hadn’t really worked because stock turnover was too slow. Their business model self-funds staff costs (1.5 full time equivalent during opening hours), but there were constant challenges; for example, the stock budget was not increasing whereas the costs were rising. Conference rooms had been developed further from the initial dedicated resource (which had originally been set up with adult learning sessions in mind), and grown by adapting and using previously wasted space such as storage rooms and making previously specialist rooms multi-purpose spaces for hire. The service had also made targeted investment in presentation kit based on customer feedback. The service was embarking on a detailed costing exercise to develop and establish realistic and sustainable charging approaches and were also planning wider marketing to external organisations, building on local Chamber of Commerce partnerships (they were already seeing a shift from primarily internal bookings). Ann and Louise also talked about using their foyer and window space to host exhibitions and promotions. The foyer was often booked out nearly a year in advance. They hired these spaces out on a flat charge basis as they had not yet found a satisfactory commission basis to use with the exhibitors. They also used ebay to sell old stock and equipment, with proceeds going back into library budgets; and had set up 2 Bookends stores to sell withdrawn stock. And despite high competition in coffee-loving Brighton, the Jubilee Library cafe (which had been let on a tender to an independent with the library taking a % of profits) was thriving. Top tips from Brighton and Hove? Watch out for people with retail backgrounds during recruitment - and use their insights if you employed them! This session was led by Melanie Mills, who leads work on providing finance to fund social investment. Social investment is the use of repayable finance to achieve a social as well as a financial return. As such, it sits somewhere between philanthropy at one end of the spectrum and more traditional bank financing at the other, with investors accepting a higher risk in return for social benefits, and because they could gain certain tax reliefs against their investment. To achieve this, you do need a proven income stream with a degree of profit margin. This sort of financing is not open to local authority run services, but could be accessed by organisations like independent libraries, social enterprises, trusts and mutuals. So even if it might not be relevant to you now, it’s worth knowing about what it offers in case circumstances change. It could be used to do things like buy a building, or to support ways to generate more income. Sums weren’t necessarily high - the average was around £65,000 - but it was easier to get this sort of financing if you had an asset to secure it against. Some library and leisure trust organisations were already using this sort of finance; for example, Greenwich Leisure had benefitted from investment to develop community sports facilities as had community library hubs in Lincolnshire. Melanie suggested that anyone interested in exploring this further might start by looking at the Good Finance website, which exists to help charities and social enterprises navigate the complex world of social investment. The site has sections explaining what social investment covers, information on investors and advisers, a tool to help you decide if it’s for you, and numerous case studies. Evidencing your social impact will be of fundamental interest to social investors. The Good Finance website has a useful tool to help organisations think about how to measure this, looking at a range of outcomes and target groups. One of the top tips here was to measure what you value - rather than only valuing what it’s easy to measure. Melanie also mentioned a raft of new developments it was worth being aware of. Crowdfunder provided a potential way in to peer to peer lending, with Big Society Capital potentially matching funding. Big Society Capital had produced a Simple Guide to Financial Promotions for trustees, directors and senior managers of charities and social enterprises explaining the key questions they should ask when considering raising investment into their organisation. It covers the financial promotion rules, their practical consequences and the possible exemptions that might apply, and finishes with examples of how different types of organisation might raise investment from a small group of investors to the general public. She also pointed attendees to the Access Foundation, which provided some help in looking at raising blended capital (part loan and part grant). The final session was led by Sue McKenzie, who was previously head of service in Brent. She led discussions about the pros and cons of using grants, Friends Groups, sponsorship, charging and crowdfunding as ways to raise extra money. Again, issues around ensuring that you develop the right skills set and approaches came up, as did the importance of making sure you were clear on the resources you’d be investing in trying to raise money. Measuring Outcomes - giving guidance on how to create an outcomes framework to measure and evidence the impact your service makes and support you in advocating for continued or new support from stakeholders. On crowd-funding, the advice was to involve your community as early as possible to help you decide what people would find acceptable to use this for. Sue’s advice was that this approach was most likely to be successful if you used smaller and localised appeals - the more specific the better. "The workshop was incredibly useful; great case studies and guest speakers, good opportunity to network and share best practice and discuss challenges and some practical examples/ideas to take away"
What is a Library? What do the public want and expect?!! The short answer to my question is, that they expect a place that offers them the chance to browse and borrow a huge and interesting collection of books., coupled with perhaps a read of the daily papers, use of reference materials and the services of trained and competent staff. There are many libraries now trying to raise very small amounts of cash with commercial services inside the library. This is not their role, not their job, and I am pretty certain the profit is, if any, are minimal!! Locating a library adjacent to a major shopping outlet or within and shopping Mall, especially if reduced or no rent can be negotiated, is a much better idea. Let’s face it, libraries are not known for their business and entrepreneurial skills. But such a location would increase footfall for the main purpose, of borrowing books or using reference, and IT services. Making a profit in many business is not easy, and for a library probably isn’t at all viable. Use of staff not trained or wishing to sell goods, detracting from the main business and recouping tiny amounts. Museums however, make a great shopping experience., for a number of reasons. They are separate stores within the museum. They cover major exhibitions, with artefacts etc. from the subjects and exhibits. It is excellent for gifts and high class items for homes, birthdays etc. Often jewellery etc. But in really good accommodation with properly trained staff and a wide range of top quality goods for all ages and all occasions. The people who go to museums usually visit the shop, and often the very good tea rooms. People also go to the museum shop if not the museum, to get unusual and good quality gifts. With any business you need skilled staff, great stock, be a place that is ‘Must go to’ for gifts etc. A Library does not have these attributes. Stick to what you know! Why is the Task Group even bothering with this unrealistic marginal area!! While they fiddle with silly ideas, libraries are falling like raindrops!! This post and the whole stream of work it describes fails to show any understanding that one of the fundamental features of a public library is that it is a place where people can go without feeling they are obliged or likely to have to spend money. That is true of small families, school children, people out of work , and people who value reading as a pastime and libraries as a place in the community. Even charging for rental of films and music actually generally costs more than the income it provides- so such activity is not helping to raise funds - even though, of course this is perfectly valid and important work for libraries. Making even small amounts of money in a local business - enough to pay a willing family member who will work all hours - is not easy at all. It is very hard to generate cash in a small business, as high streets all over the country show. These ideas for generating money in public libraries have been explored over and over in recent years as the briefest look in the Task Force filing cabinet would have revealed. To raise them yet again is a serious distraction from the work that library managers and councils need to undertake at the present time. There is no evidence that they have done anything but waste public money. Examples from museums, arts centres and places like the British Library, are completely irrelevant to public libraries around the country. In reply to both the comments above: The Taskforce are concerned about the financial pressures that libraries face, and while income generation is not going to be a solution to all these, we are aware that many library services will have been set income generation targets. Where this is the case, we want people to be equipped with sound information and advice so they can make realistic decisions about what they take forward based on the best evidence and good practice available. Once people have found out about the investment that is needed for a particular project, or the levels of return that can be achieved they may decide that particular approaches are not for them. But we have heard of some activities which surprised even the people who put their plans together, with initiatives performing beyond expectations. One particular cafe, which is run on a franchise model, has proved so successful that the local cafe owner who took it on has now closed his original cafe to concentrate on the library site. Regarding the workshop itself, we asked if people would be interested in the opportunity to hear from a range of speakers, and to discuss the topic, and they said yes. We were over subscribed and could easily have run more in other regions. As that is difficult in practice, our approach is to run a session for as many people as we can accommodate, then write up and share the information covered on the day so others can at least read about the topic. In this particular example, we hadn’t known about the work of the Association for Cultural Enterprises (ACE) until we put the agenda for these workshops together - and discovering the range of material they produce was very welcome. It is relevant to the work libraries do, and we are happy to share it. I have quickly scanned this report, but cannot find any financial information, e.g. Any surplus, profit? Nothing in the paper above indicates that any enterprise has actually contributed significant money to the proper operation of a library service - you have shown no complete figures. Nor have you anywhere analysed how money within councils is actually spent nor given any guidance about where costs can be saved that do not damage the service to the public . It is particularly appropriate now to reflect on the value and relevance of what is being discussed. From reports in the media, one might conclude that the Prime Minister examines her conscience daily and is open to performing better. Such introspection within the Taskforce would also be welcome. Members might recognise that the feelings of grievance that are currently widespread can be remedied if an effort is made. You might agree that people have been dissatisfied on a number of counts which could feed unrest. There's a massive gulf between the 'haves' and 'have-nots' in our society. A happy society will be seen to have leaders who give a monkeys. This has been proved over the past few days. By the same token it should have a Libraries Taskforce which connects with the mass of the people who clamour for public libraries of a consistent quality. Surely, if 'austerity' is dead (much publicised since the General Election) it is mystifying to you as well as to me why library authorities must grub around for cash by selling their souls to the devil and why the Taskforce must be in the business of facilitating it. Please tell the PM and her ministers that a pragmatic first step toward damping down any discontent threatening the nation and the ruling party would be to invest in/re-instate professionally-run public libraries in every community. It's only common sense.